I built USMCA.com easily thanks to GoDaddy’s wizard and Beaver Builder. Last week I wrote about a problem with WordPress: it’s simply too difficult for the typical small business owner to figure out how to create a website using WordPress. I mentioned that the best experience I’ve found for creating a WordPress site is GoDaddy’s managed WordPress hosting. The on-ramp has two key features that make it easy. First, there’s a wizard that walks you through a quick start process that creates an initial site based on your industry. Second, it uses Beaver Builder Lite to allow you to edit pre-designed templates to your liking without coding knowledge. I created a site this way on USMCA.com over the weekend. Last week the United States, Mexico and Canada announced a new trade agreement designed to replace NAFTA. It has a rather unimaginative name: United States-Mexico-Canada Agreement, or USMCA. Shortly after the news was announced I looked up USMCA.com and found that it had a buy now price in GoDaddy’s NameFind inventory. I bought it. 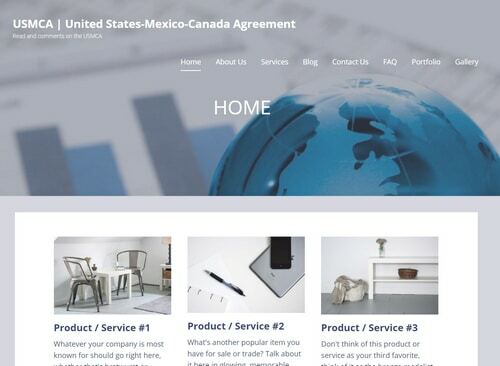 This weekend I created a site on USMCA.com using GoDaddy’s managed WordPress hosting. From there, it’s easy to use the built-in Beaver Builder to make changes to the content blocks. Beaver Builder works similarly to many of the website builders on the market. You can make a lot of site changes without understanding how to code and without inserting widgets. I don’t know if this is easy enough for someone who hasn’t used WordPress before, but it’s a heck of a lot easier than figuring out how to download and install a theme or framework. This is the sort of experience that needs to be offered to non-technical people creating a website. Ideally, this is combined with some sort of “WordPress lite” that doesn’t include so many options until the user is ready to unlock them.